In response to some questions I want to posted some information on how to move money to the USA for when you move there to live. The concerns are security and how to convert your money without giving too much of your money away in commission or currency exchange charges. So – if you are only dealing with a small amount of money (say, less than $10,000) you could decide to carry that cash with you into the US. I would suggest that you carry proof of where that money came from (so a bank withdrawal slip or something) as governments sometimes impose rules about how much cash you can carry. Upon entering the USA you will have to fill out a form and one of the questions asks whether you are bring in more than $10,000 in cash. Though carrying amounts greater than that is not illegal, the cash would need to be declared and the proof of withdrawal helps explain that the money is not the proceeds of crime. However, travelling with large amounts of cash is also a security concern. Consider how badly affected you would be if you lost that cash. For people immigrating to the USA with larger amounts of cash, you will certainly want to consider a “telegraphic transfer” of money – from one foreign financial institution to another based in the USA. That is more secure as you don’t have to carry the large sum of money. Most banks can arrange that but will charge various fees and may not give very good exchange rates. On larger sums of money that can mean a big difference in how much money (in dollars) you end up with in the USA. Please put some thought and planning into that. If you go to an international airport almost anywhere in the world you will find a kiosk or office providing currency services. They typically have a board showing the rates that they buy or sell various currencies. There is a difference between those two rates (the buy and sell) is called the spread and that difference is their profit. They may or may not also charge commission, but if they say they are not charging commission you can be sure that their spread is quite large. On small amounts the convenience might outweigh the concern about how much money you give them, but you should at least consider whether you want to hand over your money and let them profit at your expense. Banks do a similar thing. So – if you ask your bank to transfer money to the USA they will perform the transaction at a certain rate. In most cases you can beat that rate by going to a specialist Forex broker. 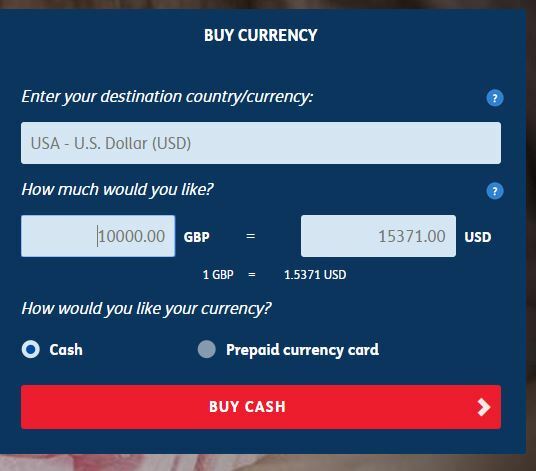 I have taken some screen shots from some United Kingdom currency exchange options. These are UK specific and in British pounds, but it will help illustrate the point. The UK Post Office is considered a public service in the UK and most people would expect their currency rates are fair. They are fair – but I wouldn’t use them!!! Look at todays rates. As of today GBP:$ exchange rate is around 1.572 (each pound is worth $1.57 cents). 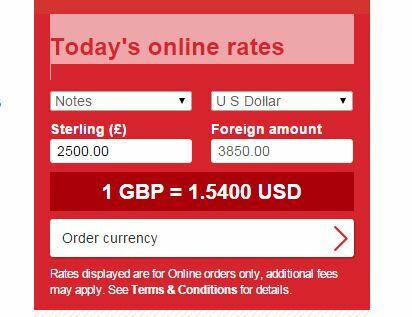 However, if I convert GBP2500 to dollars here is the rate they will currently give me. As well as taking 3 cents from every pound, they will in addition charge me fees, so I might only get about 1.51 or 1.52 depending on the amount. Let’s say I only wanted that currency for a trip (not to immigrate) and I want to sell unused currency back, the post office will now use a different rate to calculate how much they will pay me – like this (screenshot taken today also). So – the post office is working on a spread of about 15 cents – 9 or 10%. That means about 10% of your money would go if you do buy and sell transactions. Another well known UK company – Travelex, is pretty much the same. Now, compare this with a Forex broker such as this. You can see the rate is about 3 cents higher – about 2%. That might not sound a big deal – but if you are moving largers amounts that difference can be thousands of dollars. The banks typically cannot off the same rates, although they may be better than the high street rates I gave above. So – I highly recommend you work with a specialist Forex broker. If you do so the process will be something like this. Setup an account with the Forex broker. You transfer your money in local currency to an account with the broker. At some point that you agree with the broker you execute your conversion. You can work with them and take their advice – currency fluctuations over a few hours or days can make quite a big difference. They are experts they can advise you when to secure the US dollars. Your money is transferred to a US based account with your broker. You open a bank account in the USA – and give the Forex broker those details to draw your money into the new account. Because it is a USA to USA transfer the fees for that from your bank will be minimal. Obviously please make sure you are working with a reputable Forex Broker. If you have a large amount of money to transfer it is certainly worth making personal contact with the broker to get the best rates and advice. As you probably know the strength of the economy and currency can vary greatly. This can have a dramatic effect on how much money you receive in the USA. 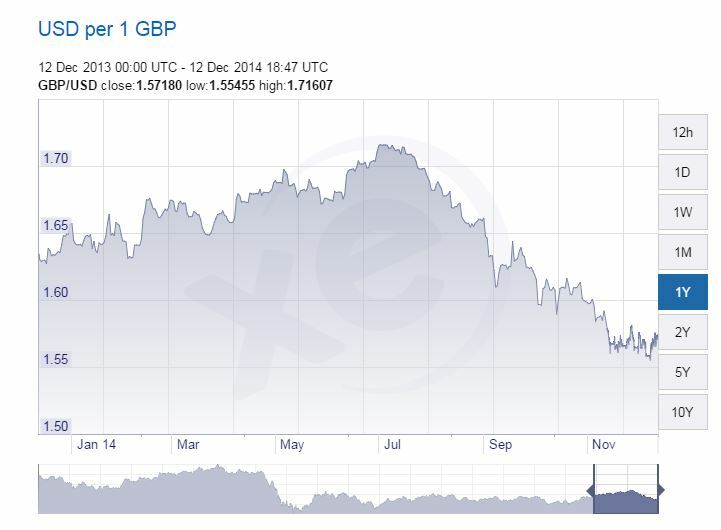 Take a look at the chart below that shows the British pound against the dollar. It shows a transfer of GBP 100,000 made in July would have converted to about $170,000. The same transfer today would get $15,000 less – enough to buy a small car. The point being that anyone transferring a lot of money needs to take into consideration the currency fluctuations and try to plan ahead. It might be a good idea to perhaps split your transfers into smaller transfers over a period of time to even out the fluctuations. There are many crooks out there. You must be sure that your money is protected, so do not use a company/service that you don’t have full trust in them. what best way to transfer money to relative in usa ? transfer to his bank account or send him telegraphic transfer ? what about taxes? and should he prove that money transfer from person with dv migration ? That depends on the bank, the amounts and so on. The recipient won’t pay taxes but you should both keep good records in case there is a question about the money. I live in Ethiopia, the maximum you cant take is a thousand or two out of the country. There’s also no way you can transfer the money as it is not allowed to do so. What alternative do I have? When a newly-arrived immigrant transfers money from abroad to a US bank account, is he/she considered liable to pay taxes for the transaction? No. Taxes are paid on income, not transfers. But if I transfer a large amount ($200-300K). If I sell my house before I enter the states as a resident and then, after opening an account there, will want to transfer the money to that account will I be liable for an income tax? Would that TRANSFER be INCOME…..
Any allowed time window to transfer money from my account abroad to my US account without being liable to pay tax for the received money? Is it advisable to transfer the money as early as possible to prove that such money was not an income? Transferring money, even years down the road, does not mean you have to pay tax. However, you must be prepared to show that you had that money as “savings” rather than income after you become an LPR so you have to keep good records. You also have to report financial accounts with over $10,000 in them every year. So – if you don’t report the savings (risky) and then get money from thin air, you could expect to have a hard time proving that was not income. Thanks very much for the explanation, just want to know when I have to report such financial accounts with over $10,000 in them every year? Is it in December every year? To whom? Reported directly or through an accountant? And in what form? Again, thanks for your help. And it is $10k total foreign account level. So – if you have two accounts with $6k and $5k – you need to file the FBAR. Should I file this by the end of the year (December)? Thanks Brit! What about payoneer prepaid master card or pay pal? Can I put my money there and use their bank staments in the interview as well ?! You can try if that makes sense. Brit, want to know if i bring more than 10k lets say 20k what i will be required to show in airport? I’m immigrate totally and have to bring some money to USA, i will declare that i have 20k.what kins of undesirable situation do i need expect? Then after opening bank account over there, my parents will send me the remind amount of money.lets say another 20k.is there any problem? Do i need any proof for that money as well? You should not carry $20k – that is a lot to lose. we are a family of 6 persons immigrating under DV visa to USA, can i carry with me more than USD 20K as the USD 10K will not be enough at all. Please advice. You can, but it would be foolish to carry that all as cash (risk of losing that money). How it will be lost? Grabbing?? Or what? Hi brit, my wife and i are dv lottery winner so is it possible for me to carry 9k$ and my wife also 9k or for both total amount must be 10k. I don’t recommend carrying that much money. Another option is Transferwise, I have been using them for several years to transfer money around and they have very low fees (.5% to 1% depending on the currency) and are using mid-market rates. Normally no. Read the FAQ about transferring money. Thanks for this article! We are moving to the US on a green card and have bank accounts in the US since we lived there for a while. Is there a limit on the amount of money we can transfer to our US bank accounts? Will we have to pay US taxes on this amount? You pay taxes on INCOME, not on transfers of money already earned/taxed. Thank you so much for your response. Must this transfer happen at the time of the move or can I move my money later when the exchange rates are more favourable?